Holographic Imaging Market size was valued at USD 331 million in 2017 and is expected to witness 34% CAGR from 2018 to 2024. 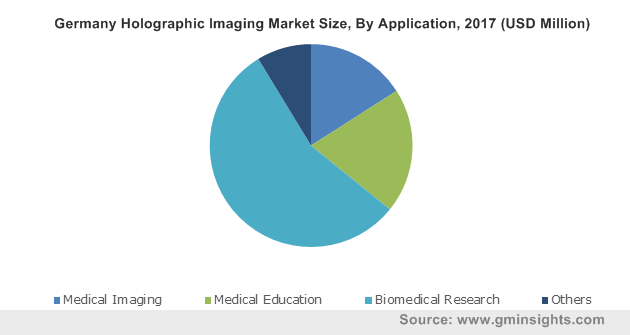 Growing awareness regarding usage of holographic imaging in medical education will boost the holographic imaging market growth over forthcoming years. Newly developed holographic imaging systems possess high efficiency and gives clear 3D images that aids the research processes. Moreover, government in developed countries such as UK and Germany implement several initiatives that facilitates the research process undertaken for studying orthopedic and cardiovascular disorders thereby, augmenting the demand for holographic imaging systems in future. Furthermore, there has been a considerable increase in the adoption of holographic imaging system for conducting biomedical research process in India that will further stimulate the holographic imaging market growth in coming years. Increasing demand for holography technology in developed countries will positively influence the industry growth. Recently developed holographic systems have ability to diagnose diseases and find high preference as it offers non-invasive diagnosis. Holography has intense applications in ophthalmology, orthopedics and dentistry. For instance, holograms have been extensively utilized for storing orthodontic models that aids accurate diagnosis and holograms are highly preferred as they are clinically reliable. Moreover, it also allows comparison and helps in tracking the progress in patients having dental problems will significantly boost its adoption. However, high cost associated with processing holograms will restrain the holographic imaging market growth up to some extent. 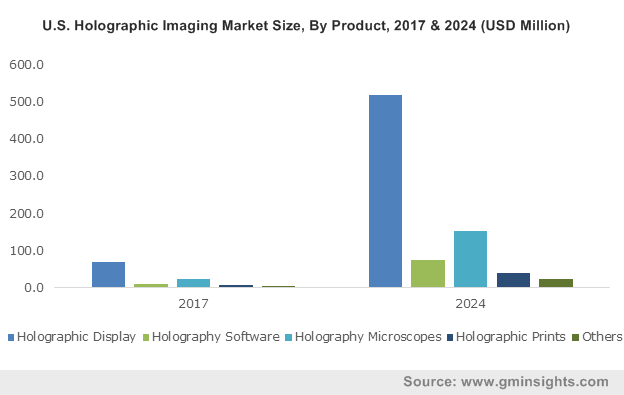 Holographic microscopes segment was valued at USD 67.5 million in 2017 and considerable revenue size can be associated with digitalization in holographic microscopes. Advancements in holographic microscopy has positively impacted the segmental growth. For instance, industry players try to add innovations by combining real time, nanometric resolution and non-invasive 3D observations that has revolutionized the digital holographic microscopy. Newley developed microscopes are highly preferred amongst the scientists and researchers involved in biomedical research that will propel the segmental growth. Holographic software segment will experience 34.3% CAGR during the forecast timeframe. Clinicians and doctors are now able to use software and digital hardware that helps in accurate diagnosis of disorders. It helps the doctors to analyze abnormal or 3D complex structures that improves the surgical performance thereby, positively impacting the segmental growth in foreseeable future. Medical imaging segment accounted for 15.9% in 2017 and is expected to show similar growth trends over the upcoming years. Considerable segmental revenue share will be associated with growing usage of holographic systems in medical imaging. Technological advancements integrated within the holographic imaging systems has boosted its adoption amongst the doctors and clinicians. Also, key industry players try to innovate new holographic systems. For instance, companies are currently developing interactive holographic video technology that has a greater potential in medical imaging. Developing such new holographic systems will boost its adoption thereby, fostering segmental growth. Medical education segment will experience 33.1% CAGR during the forecast timeframe. Extensive utilization of holographic systems in studying defects in several internal organs will positively influence the segment growth. Holographic systems produces superior quality 3D images as compared to conventional X-ray systems that helps the medical students to learn anatomy of internal organs easily. Thus, high adoption of holographic systems in medical education will propel the segment growth in the coming years. Research organizations segment was valued at USD 46.6 million in 2017 and is expected to have enormous growth during analysis period owing to rising adoption of digital holographic software. Developed countries such as Germany undertake numerous research activities for developing new therapies and drugs for diseases. Research studies requires study of internal organs and availability of technologically advanced holographic systems will increase its adoption amongst researchers that will escalate the segmental growth in upcoming years. Hospitals and clinics segment will grow at 34.0% CAGR during the forecast timeframe. Significant growth will be as a result of high adoption of holographic systems for diagnosis of various disorders. Holographic systems provides non-invasive methods for diagnosis that will increase its preference. Moreover, innovative technology introduced within these systems will help the doctors to better analyze the 3D anatomical images due to availability of technologically advanced software that will boost the segment growth. U.S. holographic imaging market will experience 32.6% CAGR and is expected to grow substantially during the forecast timeframe. High market growth can be attributed to adoption of technologically advanced holographic systems in diagnosis of cardiovascular diseases. Newly developed holographic imaging systems possess the ability to project 3-D images from datasets created by rotational angiography, magnetic resonance imaging or 3-D ultrasound such as transesophageal echo, computed tomography. Growing use of structural heart interventional holographic imaging devices will help in reducing the symptoms of diastolic heart failure thereby, positively impacting the industry growth in near future. 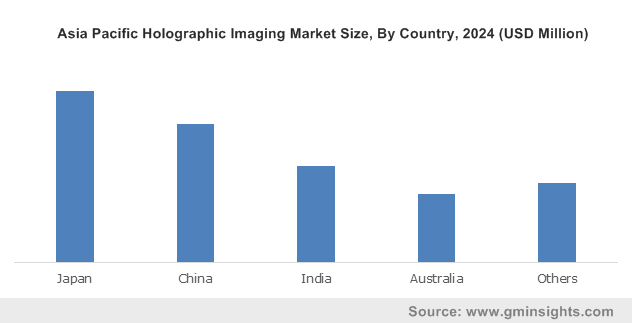 India holographic imaging market was valued at USD 11.8 million in 2017. Growing awareness regarding availability of holographic imaging systems will boost its adoption. Furthermore, government initiatives and funding have facilitated the research activities that will trigger the usage of holographic imaging systems boosting the India holographic imaging market growth during forecast period. 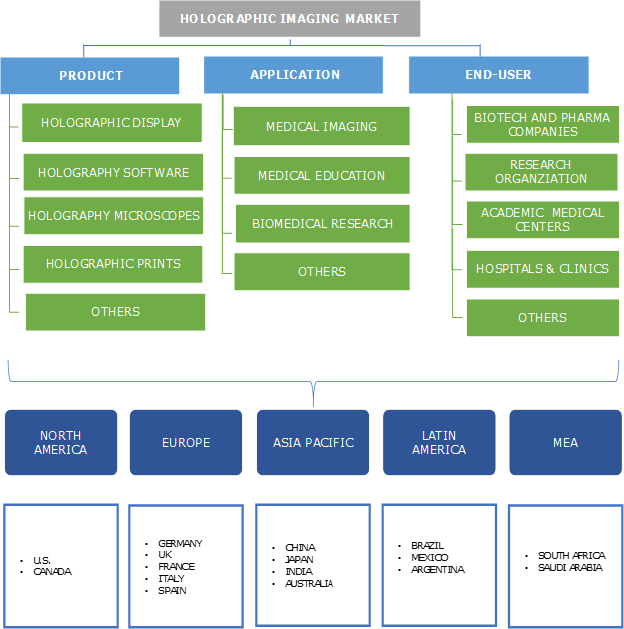 Prominent industry players operational in holographic imaging market includes EON Reality, Holoxica Limited, Mach7 Technologies Limited, Phase Holographic Imaging, Ovizio Imaging Systems NVSA, Zebra Imaging, Nanolive SA, RealView Imaging, EchoPixel, Lyncee Tec SA and zSpace. Key industry players undertake strategic initiatives such as new product launch, strategic mergers and acquisitions that renders them with competitive advantage. For instance, in January 2017, Holoxica developed 3D holographic display for visualization of 3D medical imaging data. Newly developed 3D holographic displays will be able to display footage of internal organs. Development of such new devices will foster Holoxica’s company growth. Holographic industry is still in developing phase and is yet to experience numerous growth opportunities in the forthcoming years. Technological advancements in holographic systems have transformed the research processes by enabling real-time 3D imaging. Moreover, holographic imaging industry has evolved drastically, and the systems being utilized by doctors and clinicians have been digitalized that has made disease diagnosis easy. Traditionally used microscopes and software have now been replaced by the holographic imaging systems as the key industry players are focusing their efforts on R&D to add innovations that will enhance users experience with real-time 3D imaging.